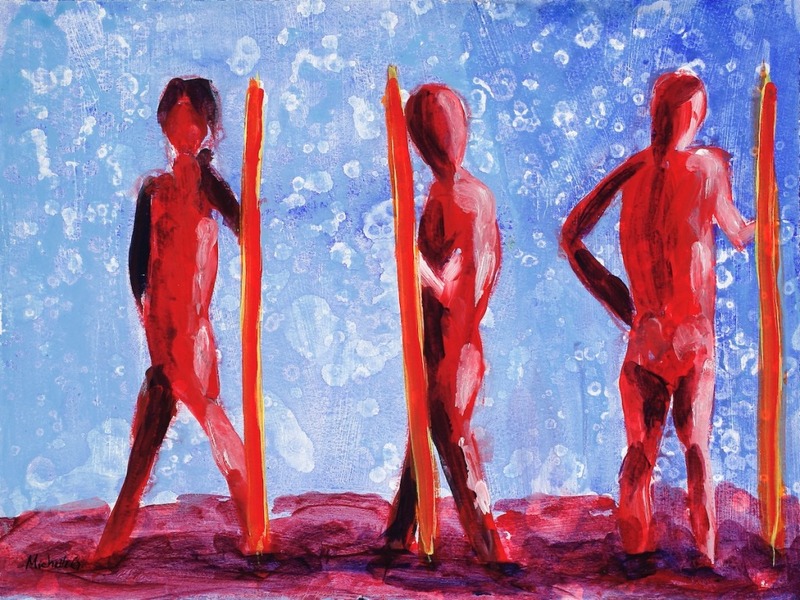 This original abstract figurative painting is created with mostly red and blue acrylics on watercolor paper. It was done working with only one model, but repeated from slightly different perspectives 3 different times to create the feeling of 3 men on a walk-about. The vibrant red and blues of this painting make it ideal for someone who loves color. This painting was created on high-quality, Fabriano-Uno watercolor paper. And is varnished in a medium gloss. This original 11 x 15 painting comes in a 16 x 20 white mat, ready to frame. And is signed by the artist. I hope you enjoy this piece of art work as much or as more as I have in creating it. In order to ensure the safety of this piece during shipping, all original and limited edition art work is professionally packaged and shipped via UPS or Fed Ex. Is this a gift? Let us do the shipping and gift wrapping! Just tell us who your gift is for, what the occasion is, and what you would like the card to say. We will ship and gift wrap with a personalized card for you. **No Prints Available For This Painting.